America has its own famous dotcom company, need not me to further introduce, who does not know Amazon.com or eBay.com? Yahoo! and Google have also subsequently made the e-commerce business a great success. But have you guys heard about the fishpond.com? Certainly you would not think it is some kind of online fish market, won’t you? 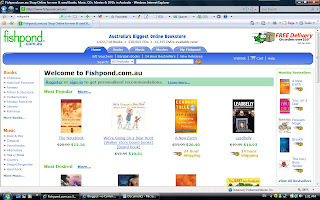 Similar to Amazon.com and the rest that I have mentioned, fishpond.com.au is the Australia’s largest online bookstore that sells all kinds of books, CDs and DVDs. It is founded by Daniel Robertson in 2005. With its global headquarters located in the Auckland, New Zealand and also the satellite offices in Melbourne and Perth, this online bookstores has successfully enter the e-commerce market and stands out from the crowd. What are the competitive advantages it holds in order to feed the growing market? Let’s explore for more details. A good customer services, efficient and wide variety of choices would have earn the trust and loyalty of its customers. In the context of e-commerce, fishpond.com has done it in a nice way with innovations. For example, it provides special features like cash rewards, a loyalty program that allows users to write the product review in the webs and the first reviewer will earn a $0.20 credit each time for future purchases. Besides, the launch of ‘Sell Yours’ program in 2005 enable the public users to sell their own products through Fishpond's high traffic site. This move diversified the supplier base for many products, giving shoppers greater choice. It allows independent authors and other motivated sellers to offer their products on sale and also second hand items that must be priced at least 10% lower than listed price. It benefits the customers because they can get lower price than other bookstores offers. Want to buy music CDs but not sure you like it or not? Fishpond’s sample music allows users to listen to short clips of each track on the CDs. So customers can have the privilege of listening to the music first whether they like it or not before they order. Besides its global shipping destinations enables customers from all around the world to purchase online. Any enquiries will also be entertained by the dedicated help desk team via email. Therefore, they can understand the customers well. Other than that, the method of payment is equally important for the company. With the multiple payment methods, shoppers are not restricted to credit card payments, they can use Paypal, bank transfer and cheque as well. Fishponds.com has make itself successful by providing shoppers with all kinds of unique features that makes online shopping even more easier than u think. That’s the ‘secret weapon’ every dotcom company must have to make e-commerce a success.